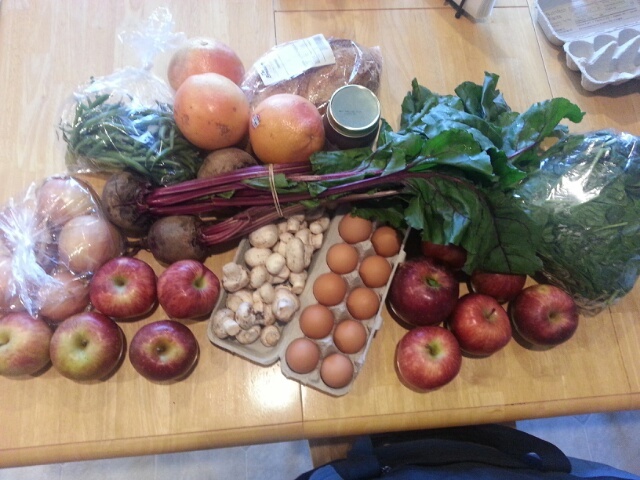 Last week’s pickup: potatoes, green beans, apples (six Stayman, six “Red”), three beets, three grapefruit, mushrooms, eggs, a bag of spinach, eggs, bread (Breadery sourdough), and a bonus item. I picked apple butter. The other choices were horseradish mustard, salsa, or applesauce. In previous years, Breezy Willow offered a bonus item (usually preserves, honey, or cheese) once a month, in place of eggs. This year it’s along with eggs. I’m pretty happy about this, because we really got in the rhythm of a certain number of eggs per week, and the monthly egg interruption threw us off a little every time. Also, yay for a true “bonus” item. Last night I threw a bunch of CSA root vegetables in a Dutch oven with a big hunk of lamb from Wagon Wheel Ranch (unfortunately I didn’t look at the label, so I’m not sure what cut it was), some Guinness, and lots of stock and flavorings. It turned out phenomenal, so much so that I burned my tongue going back for second tastings straight out of the oven. Great for cold-weather cooking. Hey, if it’s going to snow outside (at the end of March! ), I’m going to turn on the oven. Pat the lamb dry with a paper towel, and season all available surfaces with salt and pepper. Sprinkle flour over entire chunk of lamb. Coat the bottom of a large Dutch oven with olive oil and warm over medium heat. Add the roast and sear each side for 4 to 5 minutes, or until nicely browned. Remove the roast to a large plate. A friend had a hankering for Asian fusion cuisine, so even though it generally isn’t our thing*, we checked out the Cha-Ya Asian Bistro. * I have nothing against Asian fusion, but generally when I want Thai, Chinese or Japanese, I go to places that specialize. Personally I believe “fusion” restaurants were intended for larger groups who can’t agree on a single cuisine, or maybe sushi fans eating out with non-sushi-lovers. The first item is “Crispy beef sautéed in chef’s special brown sauce.” In the Vegetable section? I suspect lazy copy/paste. 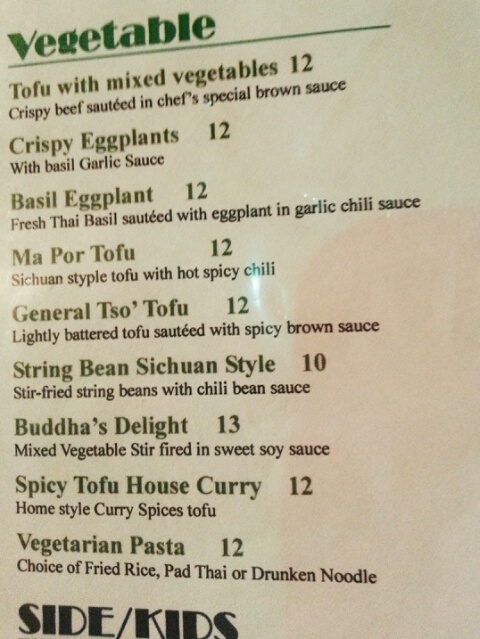 And then the last item is “Vegetarian Pasta,” but your “pasta” choices are fried rice, pad Thai, and drunken noodle. I’ll give you pad Thai and drunken noodle as a very loose interpretation of pasta, but I think it’s stretching the definition just a bit too far to include rice. “Mommy feed… myself?” I ate a bite. “No! Mommy feed MYSELF!” And he pointed into his open mouth. So Mommy kept feeding him. We’ll work on proper usage of reflexive pronouns at another time. Just saying, if you’re going to have a whole kids’ menu section, it might be nice to also have kid-sized silverware. Anyway, I got the Mandarin Pan-Fried Noodle dish (I think that was its name) and it was just what I wanted: a lot of thin egg noodles, fried crispy around the edges but still soft and dripping with sauce in the middle, piled high with chicken and vegetables. Others at the table got drunken noodles and green curry. Everyone seemed to have a good time. When ordering, they’ll ask you how spicy you want it, on a scale of 1 to 5. Personally I was dubious over the fidelity of the spiciness scale – what do they do, just hold the bottle of hot sauce over the wok and give it one to five shakes? Or put in exactly one to five spoonfuls of chopped chili? Anyway, I ordered mine as a zero on the spiciness level, so I will never know. I hadn’t been inside the restaurant since they renovated. They took over where the old coffee shop used to be, and now the place is dominated by a giant curving bar… at which no one was sitting, at least not between the hours of 6 and 7 on a Wednesday. The bar takes up the center of the restaurant, and then the outside areas are filled with tables, which is where most of the patrons were sitting. The service was attentive and courteous, and the servings are very generous. Next time we have a group of people who are indecisive about cuisine, I wouldn’t mind going there again. I’ll put the tl;dr up front here: We got banh mi from Café Au Lait, a nice little eating space tucked into an office building on Ridge Road. The banh mi were tasty, and they’re buy-5-get-1-free. But if we want banh mi again, we’ll call in the order well ahead of time, because it was the longest I’ve ever waited for sandwiches. So I don’t know if Café Au Lait is usually slammed on Saturdays for lunch hour, but it was certainly slammed this past Saturday. 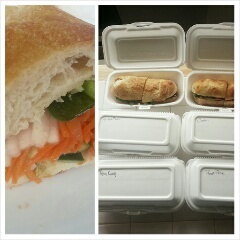 We dropped by to order sandwiches for the family: five banh mi (Vietnamese sandwiches). Then the nice young man at the counter told us that banh mi were buy-5-get-1-free; would we like to order one more? We were more than happy to do so. The young man at the counter told us that the kitchen had a lot of orders to deal with and that it would probably be a half-hour wait; would we like to go away and come back? We were a bit surprised, as our previous experience with banh mi was with the Lee’s Sandwiches chain in southern California, where the time to get a banh mi was roughly comparable to how long it takes to get a sandwich at Subway. Still, we’d wanted to try the local banh mi for a while; we agreed that we would wait for them. The place wasn’t that full, so they must do a bustling business in takeout orders. We bought a chocolate croissant to snack on (perfectly decent, though not French-bakery-crusty by any means), went over to Home Depot and ran a leisurely errand, and were back in about 40 minutes. The sandwiches still weren’t ready. The young man was extremely apologetic and offered to throw in some bags of chips. We waited maybe five or ten more minutes, and then the sandwiches finally came out. On the bright side, they were pretty delicious. We got five flavors: classic, roast pork, grilled pork, meatball, and lemongrass chicken. (We chose roast pork for our sixth baguette.) We were sharing the sandwiches among five adults, so we cut each one into four pieces. The taste varied dramatically depending on whether or not you got a slice of jalapeno pepper in your bite. Each sandwich came encased in its own Styrofoam container. (I don’t know why they didn’t just wrap them in paper; it would have taken up less room. Maybe they were afraid the sandwiches would get squished?) They were served on a somewhat softer, doughier bun than I’m used to; classic banh mi is served on a baguette, but this was toasted ciabatta. It’s okay; it was still tasty. All of the meats had great flavor, although the grilled pork was somewhat unexpectedly spicy. The pickled sliced vegetables gave just the right sweet-sour crunch. I liked it a lot, although personally I’d go with less jalapeno. So yeah, the banh mi was pretty good. It wasn’t the best I’ve had, but it still pretty good, and it’s certainly great to have banh mi right here in Ellicott City. I’m already looking forward to getting a coffee drink or a bubble tea next time I go. I’ll just be sure to call in my order ahead of time. …we waited 45 minutes for this. I made the week 3 pickup on Thursday, which actually was the first day of spring! It certainly felt like spring; the weather was nice, the sun was out, and some of the other CSA members had brought their kids to help pack up the veggies. Everyone was smiling; I think we were all glad to say goodbye to winter this year. 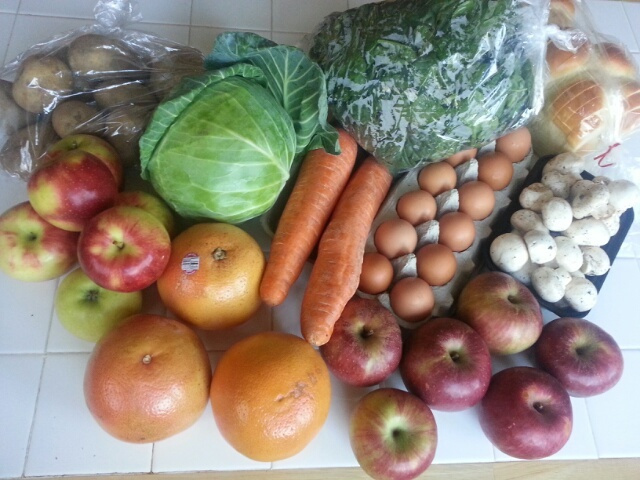 In the pickup: 3 lb potatoes, a head of cabbage, twelve apples (six Jonagold, six York), 1 lb spinach, bread (Great Harvest challah), 1 lb mushrooms, eggs, two large carrots, and three grapefruit. I could have used the cabbage last week, but it’s all right, we’ll eat cabbage two weeks in a row. We ate out a lot this weekend (more on that later, maybe), so I didn’t get a lot cooked from the share; however, I did manage a scramble with the mushrooms and some broccoli and onion. I am drowning a bit in apples though. C cooked down hers in cinnamon and sugar; I’m thinking of giving that a try. Well, it felt like spring yesterday, but now it’s snowing (again! ), so I’ll try not to get too excited. When I brought the CSA share home on Thursday, it was getting pretty cold outside, but we had gorgeous sunlight coming in through the kitchen window. 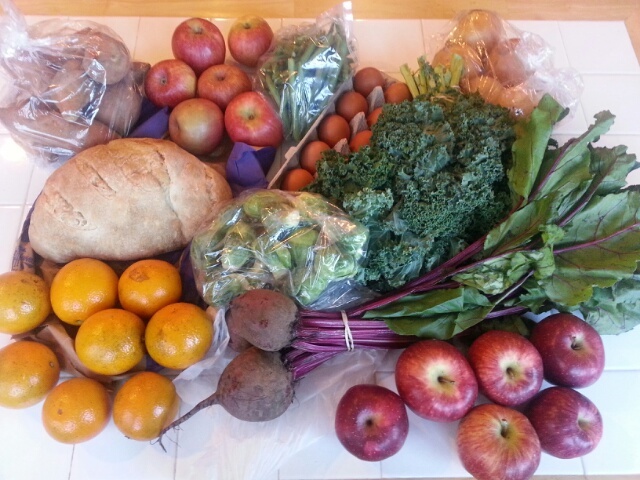 In the pickup: 3 pounds of potatoes, six York apples, six Red Delicious apples, a pound of green beans, a pound of kale, a pound of Brussels sprouts, 2 pounds of onions, a bunch of beets, eight oranges, a dozen eggs, and bread (Great Harvest sourdough). Potatoes and kale! It’s like the CSA knew that I wanted to make colcannon for St Patrick’s Day. I mashed in the sweet potatoes that we got last week, too, so it’s extra healthy with all the sweet potato nutrients. The kid wasn’t a big fan of the kale, though. Pity. On the other hand, he put away a surprising amount of cabbage. For St P’s this year I boiled corned beef according to the package directions and threw in chopped cabbage for the last fifteen minutes or so, just to get it cooked but not overcooked. I made colcannon as above, and (for a timely birthday party) smitten kitchen’s Guinness chocolate cake, as cupcakes, with a cream cheese frosting (some with a dash of Bailey’s, some without). Turned out well, except I bobbled a pan of the cupcakes coming out of the oven, and the poor things were still hot and fragile and kind of collapsed in on themselves. Oh well, I frosted them anyway. When it comes to moist, tasty chocolate cupcakes, no one is terribly picky, least of all a two-year-old. Happy St Patrick’s Day, everyone! Welcome to spring! There’s still a few piles of dirty snow in my yard, and it was so cold that the poor woman manning the CSA table at Miller Library was visibly shivering as she signed me in, but no matter: the spring CSA has returned, and with it this blog! My daily commute doesn’t take me close to Breezy Willow Farm any more, which is sad; I really enjoyed driving up to the farm, walking past the llamas and chickens, and seeing all the familiar faces. I’d signed up at the farm originally, but when I told them I had to move, they transferred me to the Miller Library pickup site with no questions asked. Although I can’t impulse-buy ice cream and yogurt at the farm store any more (you have to pre-order it to the remote pickup sites), I have to say the pickup experience was a lot faster. At the farm, they have several scales and you have to weigh anything that needs weighing; they’ll put up a sign that says “spinach – 1 pound” and there’s always a bit of a pileup behind the poor person adding and removing spinach from a plastic bag in order to get as close to a pound as possible. In the parking lot at Miller, though, there’s no place to plug in a scale, and so everything is pre-weighed and pre-bagged. Pickup was an absolute breeze. 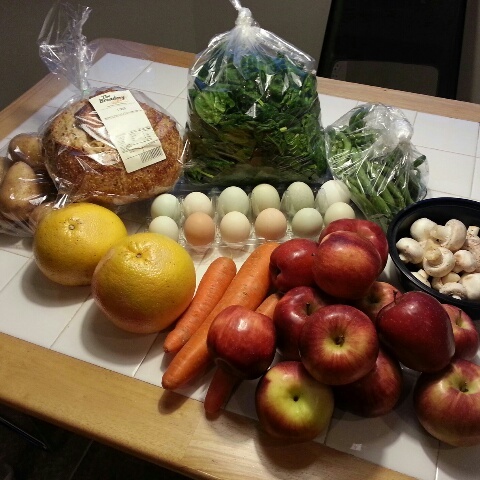 That’s a dozen apples, half a pound of mushrooms, a pound of green beans, a pound of spinach, bread (Breadery 3 seed, very seedy), 3 pounds of potatoes, two grapefruits, a dozen eggs in pretty pastel shades, and three carrots. So far the mushrooms have gone into salads and K’s stuffed peppers, the green beans were served alongside lasagna, the bread is half gone, and the spinach is destined to be made into spinach scrambled eggs with some of the eggs. We’re making good progress.